There are 3 ferry routes operating between Waiheke Island and New Zealand offering you combined total of 49 sailings per day. Fullers Ferry operates 2 routes, Waiheke to Auckland runs 33 times per day & Waiheke to Devonport (Auckland) about 4 times daily. Sealink NZ operates 2 routes, Waiheke to Auckland runs 3 times per day & Waiheke to Half Moon Bay (Auckland) about 9 times daily. As the frequency and duration of crossings on some routes varies we would advise that you do a live search for crossings from Waiheke Island to New Zealand to get the most up to date information. 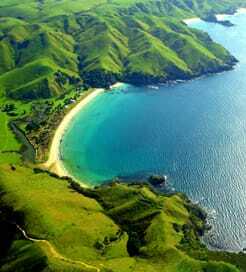 Waiheke Island sits roughly 18 kilometres east of Auckland, New Zealand in the Hauraki Gulf. 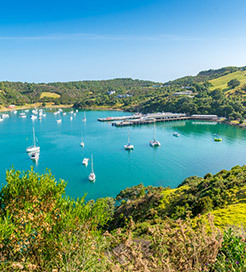 Although it lies close to country’s capital city, the peaceful Waiheke Island boasts its own dry and warm microclimate, making it the ideal weekend getaway for city-dwellers on the mainland. As part of the Hauraki Gulf Marine Park, there are some excellent areas for swimming and snorkelling, particularly in White’s Bay and Otakawhe Bay. The coastline is also blessed with some immaculate sandy beaches. Known locally as ‘the island of wine’, Waiheke has a large number of top quality vineyards and wineries, too, which are well worth visiting so be sure to organise a guided tour. As one of the most popular day trip destinations in the Hauraki Gulf, there are numerous ferry routes back to Auckland lasting around 40 minutes, to both Auckland Harbour and Devonport.